I’m a Guest Designer and a Give-Away! Hello and Happy Friday! I was so excited to be asked to be a Guest Designer for My Craft Spot. I purchased some of my favorite crinkle ribbon and baker’s twine from My Craft Spot so I jumped at the opportunity to play with some stamps. Not only that, but Kimberly has generously offered 1 stamp set (of the winner’s choice) to one of my blog readers. Now how fun is that? Here is a look at all the cards together. I created a triangle template to use to cut the triangles. Each tree is 3 layered triangles all stitched together. I love the dimension created by the trees and the texture from the star border cut from the coffee sleeve. I was also able to use up plenty of paper scraps. Now for the fun part, one lucky winner will win 1 stamp set of their choice from My Craft Spot. So what do you have to do? Simple! Stop by My Craft Spot and take a look at all the clear stamps. Leave your contact information in the linky tool below including the name of your favorite My Craft Spot stamp set by Monday, October 1st . (For example: Cheryl – Mistletoe or Crafter Jane – Happy Fall) I will use Random.org to pick the winner and post it on my blog on Tuesday, October 2nd. Kimberly from My Craft Spot will send the stamp set to the winner. Of course I would love it if you followed my blog and the My Craft Spot blog in your favorite reader, but that is not necessary to win. One Stitch At A Time - W, SIO -Challenge #182 Anything Goes. Inspire Me Fridays– W - No. 121 - Anything Goes! Link up below for your chance to win! Great cards! I am just starting my Halloween creations and now I want to start the Christmas cards! I love all of your stamps but I am such a collector of the sentiments and you have an amazing collection to offer! I am going to place an order today! I really love the 'Candy Cane Kisses' and 'Think Snow' but I know I need the 'Inside & Out' series! Wishing you a happy day today and a great weekend! I have been following you for about a year and I just love your work! Your Christmas card set is just beautiful! I love My Craft Spot and all their beautiful stamps. I think I would choose Jar Basics. Thank you so much for the chance to win one of Kimberly's wonderful stamp sets! Your Christmas cards are so much fun - a great layout for mass-producing. Thanks so much for the inspiration! 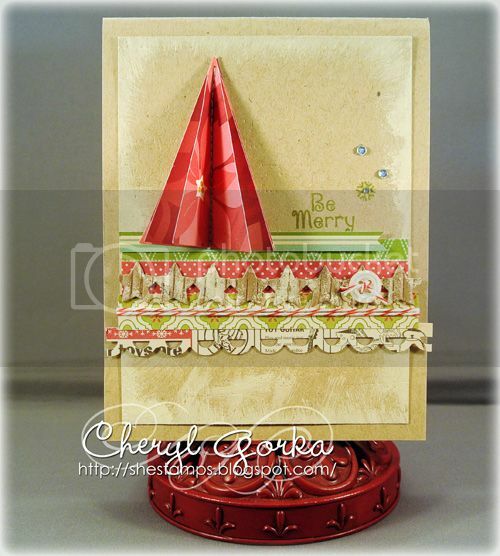 Gorgeous Christmas cards, Cheryl!! I love your 3D Christmas trees - Wow! Thanks so much for being a guest designer at My Craft Spot! Absolutely GORGEOUS cards! I love your set of cards. The papers are so pretty and the 3D tree is FABULOUS! Congrats on your GD spot at My Craft Spot!! Thanks for a chance! 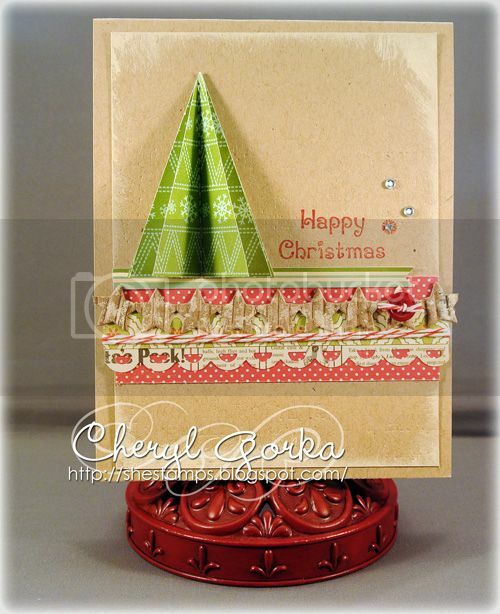 Love those Christmas trees Cheryl! Thanks for the chance to win some awesome stamps! That was hard to pick just one !!! Gorgeous cards! Love how it's the same design, but each is different, based on the paper you used! Genius! 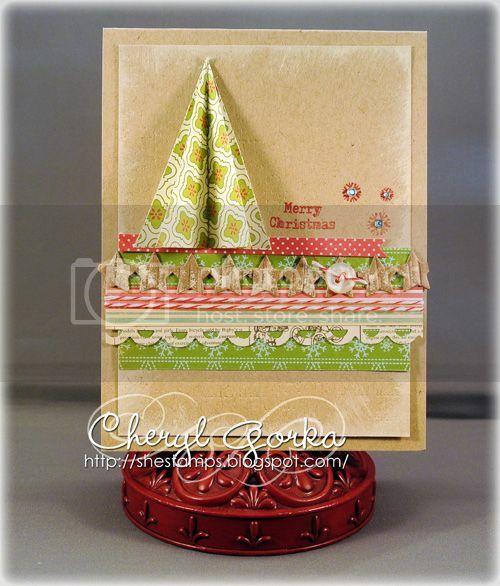 :) Thanks for playing along over at the Simon Says Stamp Wednesday Challenge Blog! Cheryl, the cards are wonderful! The belly band design provides great opportunity to reduce some stash! Thanks for dropping this off by our house here at 613 Avenue Create! Lovely cards and I like the way you have used up so much scrap! Thanks for linking up with us at Crafting with Dragonflies too. I also went to My craft Spot (Congrats on your GD spot by the way) and saw a cute set called Feel Better Soon! Hi, Cheryl! Wow-wow-wow! Brilliant idea and so beautifully done - a fantastic set of Christmas Cards. I´am thrilled :). These cards are great!! 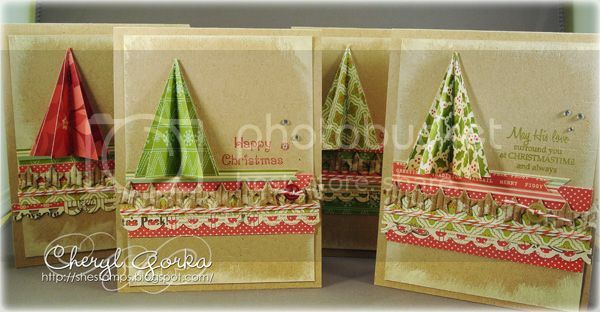 The 3D trees are gorgeous and I love the embellishments you've chosen to add. Thank you for sharing at OSAAT and good luck in the challenge. Love this set of cards you made! I really like the design of your Christmas cards. The trees are so decorative and I like the combination of papers and colors that you've used. I came over from MIM to visit. Great idea, love the cards and the tree, and what a wonderful way to use up scraps, thanks for playing with us at Crafting with DRagonflies, blessings Hilde..we currently are looking to expand our DT, if you are interested I would love to invite you to enter. Fbulous card Collection Cheryl. love the design and colours, the trees are wonderful. I love these cards! Awesome work! Thanks for the chance with the giveaway. I love your cards. Congrats on your My Craft Spot guest DT spot. These are fantastic. I love the dimension!! Your cards with those 3-D trees are just adorable! I love the design and am so happy to have found your blog! I am a new follower and can't wait to browse the rest of your posts! Love those trees!! What a great idea! Thank you for sharing and the give away. What a really beautiful and modern set of cards. I love the distressed edging to the card backing. 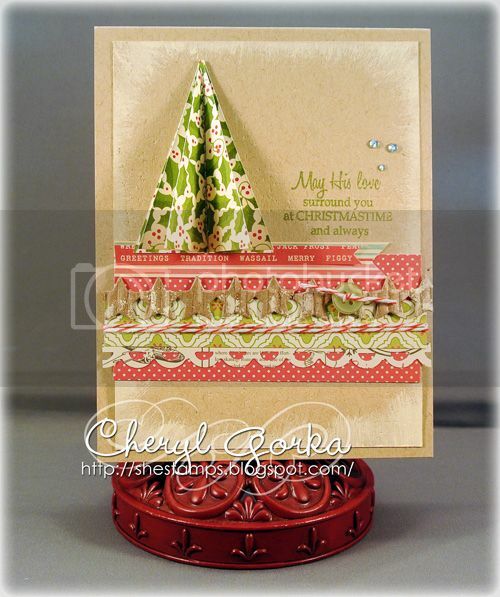 The 3D trees add a huge amount of depth to your cards, as does the beautiful multi layered ribbon strips. Gorgeous use of papers. We really appreciate you taking the time for entering this weeks LEJ Challenge No. 72 - Lots of Layers. The LEJ Challenge Blog has weekly challenges, with some of our wonderful Digi's up for grabs. Also a small crafting prize from one of our amazing sponsors. We really hope you can visit us again. This is a fabulous selection of cards, thank you so much for joining us at Bearly Mine Designs this week. Beautiful cards Cheryl! I love the wonderful layers you've created on your set! Thanks for the wonderful chance at your giveaway! ps. I have some candy to if you're interested. Those cards are so fun. I love the folded trees and the twine! Thanks so much for the giveaway. i don't have a blog so I linked to my Flickr account, hope that's okay. Such a beautiful set of cards, love the way you created the tree! I am a new follower and looking forward to more inspiration from you! Congrats on being a guest designer, I just love Kimberly's stamps, the Tiny Tag series is my favorite. Oh these are gorgeous, love the delicate layers and paper folding. Thanks for sharing with us this week over at Little Red Wagon.